Up to 16 jobs are at risk in a fresh round of job cuts at Johnston Press titles in Yorkshire, the National Union of Journalists has claimed. In a press release published on its website today, the union claims the publisher is seeking an overall reduction of 16 posts across its Yorkshire business unit. It lists the Yorkshire Post, Yorkshire Evening Post, Halifax Courier, Scarborough News and Harrogate Advertiser among the titles affected. The union says 50 community representatives including local MPs, councillors, business groups and trade unionists have now backed a statement by by its Yorkshire Weekly News Group chapel voicing concern over the impact of the proposed cutbacks. The chapel originally wrote to JP chief executive Ashley Highfield in November following a decision to axe four staff photographer roles in the YWNG division, which includes the Wakefield Express, Pontefract and Castleford Express, and the Dewsbury Reporter. Now it has written to Ashley again highlighting the latest proposed job reductions, which includes the eight YWNG titles and 19 others. A YWNG chapel spokeswoman said: “Our members believe passionately in the importance of local journalism but are being prevented from giving readers the level of news and sports coverage they deserve because of a lack of staff and investment in our papers – and any further jobs cuts will only add to this problem. The union claims that since November 2010, the company has closed seven of YWNG’s eight district offices and cut the number of editorial staff on the eight papers from 52 to 22. In the latest letter, it questions how the papers will continue to cover local elections, council meetings and the courts or run campaigns if further cuts are implemented across the publishing unit’s 27 titles. 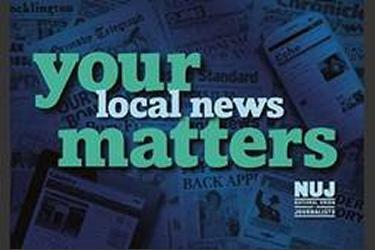 Chris Morley, NUJ Northern and Midlands organiser, said: “There is a groundswell of people in local communities now realising the damage that has been – and is still – being done to local news and the implications of that for local life. A Johnston Press spokeswoman said: “We are continuing to restructure the newsrooms across West Yorkshire and it has been known for some time the changes that are being put in place. Congratulations on winning JP newspaper of the year, your prize is ……….. Team Yorkshire swept the boards at the JP awards. Now they’re being swept out of work. The NUJ is about as effective as a church mouse tackling a snake. JP hasn’t responded. Surprise! Surprise! JP should just give up. They’re clearly not fit to run a business. You work your balls off and win awards and find yourself out of work. Nice people to work for, JP. Less journalists/photographers working for jp means even less folk contributing to my jp Pension Fund! Thanks a bunch, Ashley! Nice one – NOT! In ad creation and creative services, JP in Yorkshire hasn’t reflected the communities with “local, community content” since 2012. The titles may just be able to get away with poorer quality advertising, but not so with journalism. If only JP could embrace quality as a USP. I don’t see how criticising the NUJ is actually going to help matters. I would have thought your negative comments should be aimed at the company for slashing jobs – unless, of course, you’re the company in disguise. I carry no brief for the NUJ, having experienced their bungling on a number of occasions, but the union can hardly be slated for raising the threat of even more job cuts (whether it is old news or not). Sadly,the unions have generally fared badly when trying to oppose bullying, bean-counting proprietors who have no interest in true journalism. But, as the saying goes — Don’t shoot the messenger! All you need to know about the future of JP is in this one paragraph. Read it very carefully.